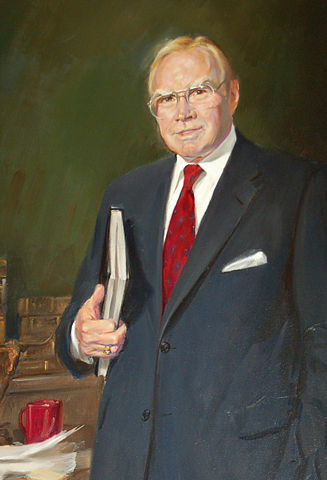 Former Speaker of the House Jim Wright of Texas died early on Wednesday, May 6. He was 92. Speaker Wright was born in Fort Worth, Texas, in December 1922. After attending university in Texas, he enlisted in the United States Air Force during World War II and flew combat missions in the South Pacific. He entered the House of Representatives in January 1955 and remained in office until 1989. He served as Democratic Majority Leader under Speaker Tip O’Neill from 1977 through 1987. Following Speaker O’Neill’s retirement, Wright became Speaker, serving until his resignation in June 1989. When a former Speaker of the House passes away, the Chamber traditionally memorializes the leader in a number of ways. We discussed the mourning protocols for former Speakers and sitting Members in the following post from 2013, which was written on the occasion of Speaker Tom Foley’s death. As expected, the Congress adopts the most common public expression of sorrow: It lowers the flag to half-mast in memory of the deceased. A little known fact, however, is that this is a matter of law, not just a tradition. According to law, the flag over the Capitol is to be flown at half-mast for 10 days for a former Speaker of the House. For a sitting Member of Congress, it is lowered for the day of death and the following day, but this period is often extended until the day of the funeral.